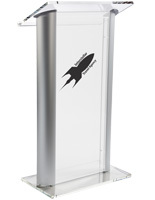 Faux frosted glass podiums that feature a smooth sandblasted appearance are another option amongst our sizeable inventory of "podiums by color". 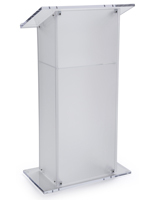 Unlike the crystal-clear lecterns, these models allow light to pass through the body of the podium while still providing an effective screen. 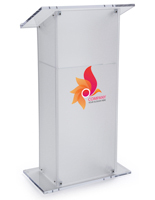 The collection can be separated out into two sections (flat or curved front panels). 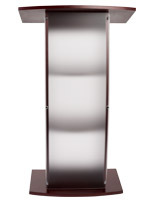 Most of these frosted acrylic podiums feature wooden accents in maple, mahogany, and black finishes. 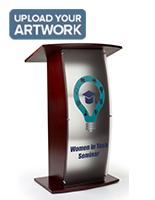 The use of real wood veneer indicates the level of quality one can come to expect from these lecterns. 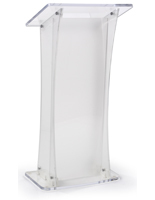 The podiums with flat fronts come with acrylic reading tops while the curved models feature wooden tops. Both varieties include an edge lip to keep your books or notes from sliding off. 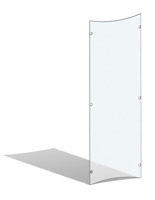 The frosted panels are mounted with metal standoffs which provide a stylish and contemporary appearance. Internal shelving (one or two) gives the speaker space to place water or notes. 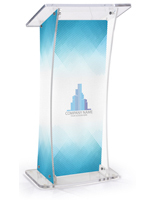 To customize your purchase, frosted podiums provide the perfect canvas for applying church, school, or company logos. For the religious sector, we offer a number of stock cross designs in traditional, celtic, or orthodox designs. 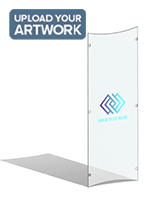 We also accept your custom logo artwork for graphics up to 2 colors. The application process involves computer-cut sign vinyl applied directly onto the front of the frosted panel. Only simplified line art (vector graphics) can be used for this process.